Villa Rajka consists of two houses. 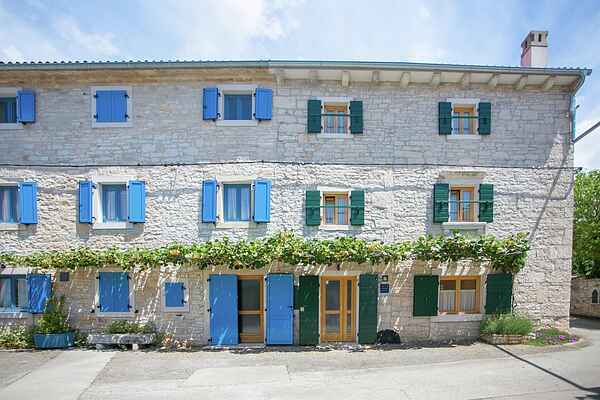 One of them is a renovated Istrian old stone house. The house consists of five bedrooms, two of them are located on the first floor, two on the second floor of the main house. Each bedroom has its own bathroom and also Tv with satellite channels. The other house is located on a separate lot, across the road, and consists of one bedroom, a bathroom and a kitchen with a living room. In front of the cottage is a courtyard with an outdoor pool, enclosed terrace and a barbecue. The property has 2 living rooms, 2 fully equipped kitchens and 2 separate toilets in total, all located on the groundfloor. Parking is available outside the house.